Legal Issues. Discussing legal issues in executive session preserves the attorney-client privilege, and allows the board to discuss litigation strategy and settlement strategies for current and potential litigation matters with its legal counsel. The association’s attorney does not need to be present either in person or by phone for the board to meet in executive session to discuss legal issues. Formation of Contracts. Boards may consider matters relating to the formation of contracts with third parties. Disciplinary Hearings. Boards should meet in executive session for all disciplinary hearings. The accused member is entitled to attend the executive session for that portion of the meeting dealing with the individual member’s hearing. Personnel Issues. Personnel matters which include, but are not limited to, hiring, firing, raises, disciplinary matters and performance reviews, if applicable to the association. Payment of Assessments. Boards may meet with members in executive session to discuss requests by delinquent members for payment plans. Foreclosure. Pursuant to California Civil Code section 1367.4(c)(2), the decision to foreclose must be made by a majority of the board in executive session. With an Open Meeting – If executive session is held with a scheduled open meeting of the board, it must be included in the open meeting’s four-day notice and generally noted in the open meeting agenda. Between Open Meetings – If a meeting is to be held solely in executive session, members must be given notice of the time and place of the meeting at least two days prior to the meeting. Notice must be posted in a prominent place or places in the common areas and by mail to any owner who had requested notice by mail. In addition, notice may be given by mail, by delivery of the notice to each unit in the development, by newsletter or similar means of communication, or, with the consent of the member, by electronic means. (California Civil Code section 1363.05(f)). This is the informal, but official opening of the board meeting. This is the time set aside to ratify the meeting minutes of the last board meeting. In addition, the board may introduce and/or ratify any business that was conducted via an emergency email meeting by unanimous consent. The board may discuss unresolved or tabled items of business from the last board meeting. This is the time set aside to discuss new items presented to the board for discussion and vote. During this time the board may also discuss matters that are regularly discussed in board meetings (i.e., discuss and approve the budget or association financials). Some boards may choose to have an open forum meeting at the beginning of the board meeting rather than the end. Either way, members must be provided with an opportunity to speak and address the board for a reasonable period of time at some point during the board meeting. 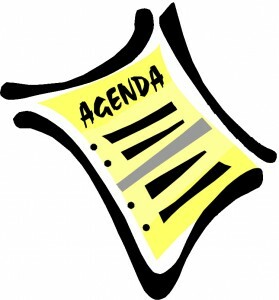 Some issues may not be set forth on the agenda or discussed by the board during the regular board business portion of the agenda. In open forum, members may be allowed to address the board regarding issues or matters requiring a vote. As stated above, time limitations may be utilized to ensure that the board meeting can be ended on time. This is a formal call to end the board meeting and conclude all association business until the next meeting of the board.